Here is our new comment line number: +1-415-830-5439. To my immense annoyance, it seems that we have once again lost our K7.net call-in number for comments: +1-206-350-7280. That isn't the bad part, really... what annoys me most is that the number still appears to work! You can call it up and leave a message, but if it goes anywhere, it is not going to us! In the past, when we've lost our K7 number, the number has been inactive to some period of time, so callers just got a message saying that the number was no longer in use. Now it appears that the number has been reallocated already - or at least is accepting calls. So please do not call that number! I'm going to use this failure as an opportunity to completely drop our usage of K7.net. K7.net is a "unified messaging" service that is widely used by podcasters because it provides a very simple and easy - and free - service: Callers call in to a phone number, leave a message, and then you receive an email with the comment attached as a WAV file. It is great for a podcaster. Simple. Easy. Just works. If a K7 number is inactive for 30 days (use is determined as a voice message or fax message to that number) , we may terminate the account for non-use. This has been the bane of many podcaster's existence. If you don't get a call in 30 days, you lose your number. This impacts podcasters, especially, because our shows may live on out there on the Internet for an incredibly long time. You can still download Blue Box podcast #1 from two years ago which has the wrong comment line included (in fact, it is 2 or 3 numbers ago). So losing your number is really quite bad from a community-building point-of-view. If you put out frequent shows and get frequent comments, this usually isn't a problem. However, if you are a show like ours where we've been only doing maybe two shows a month it may be more of a challenge. I know that here in New England, the New England Podcasters group was instituting a "reminder day" where it was a monthly day to call your comment line to be sure you kept it. In any event, we seem to have lost our number. Now, I can't really complain about the service because it is free and the K7 folks have always been very up front about the termination for non-use clause. All I can really do is find another alternative. So I've created my own little experiment in the form of a new comment line: +1-415-830-5439. And while we are NOT going to switch from using our SIP "bluebox@voipuser.org" address, it's nice to know that it is available. It uses Voxeo's own CallXML language which was developed before VoiceXML and CCXML (Call Control XML) were standardized. Why did I use CallXML versus VoiceXML and CCXML? Primarily because I wanted to learn CallXML - and also, frankly, because it seemed to have the easiest commands to do what I was trying to do. It basically says a piece of text and then records up to 3 minutes of audio and emails it to our standard comment line. Ta da... same thing as I was doing with K7.net, but without the annoying termination after 30 days of non-use. Anyway, that's the new number and the story behind it. Hopefully I won't be changing it again anytime soon! Our Blue Box Frappr map has grown to 315 member! NOTE: One of our listeners commented in the Blue Box Skype group chat that you do need to be careful about how you are signing into Frappr as it sometimes will add you with your email address versus your Frappr ID. Martin Davies has put together a great interview show about Session Border Controllers (SBCs). I think you'll definitely enjoy this one! New contributor Frank Leonhardt has an interview with some of the folks involved with Facetime about their new firewall that includes Skype management. Martyn Davies also received permission to run the audio of the panel on VoIP security that he moderated at VON Europe last week in Stockholm. I think you should enjoy them all and I'm looking forward to making them available once I'm back from vacation. 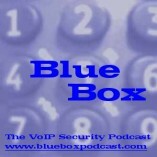 If any listeners use the Facebook social networking site, I have now created a "Fans of Blue Box: The VoIP Security Podcast" group which you are welcome to join. I have no idea, really, what we will do with the group and whether or not we'll even use it for anything at all. Largely, I suppose, that depends upon how many people join the group. It's all just part of our continued experimentation with "social media"... and anyone who wants to join in the experimentation is welcome to do so. Crossing the 100,000 download mark! Sometime this morning between about 7 and 8am Eastern US time, this podcast crossed a major milestone.... the 100,000th download occurred! Now in the world of "mainstream" media this is a trival number that would hardly merit attention. But in the new and emerging medium of podcasting, I, for one, will celebrate that milestone... especially for something that is admittedly as niche of a topic as "VoIP security"! To look at it another way, we've put out 74 shows since we started about 1.5 years ago. That works out to an average of 1,351 downloads per show... for a show that averages 45 minutes in length! That there are that many folks interested in our show and topic continues to be a very humbling fact. It's an honor for us... and a responsibility that we don't take lightly. We know that just as easily as you have subscribed and downloaded our show, you have an amazing amount of choices out there and you can just as easily go elsewhere. Both Jonathan and I THANK YOU for your continued support and participation! We have been delighted by the community of listeners and contributors that has grown up around the show and we do look forward to the continued growth of that community and to reaching many more milestones in the months and years ahead. Thank you all. If you downloaded Blue Box #56 and wound up with a PDF file, here's why - as I noted in an "UPDATE" section at the top of the show notes to Blue Box #56, I inadvertently deleted the "enclosure" link attribute that clues podcatchers in to which media file to download. Without an enclosure link attribute, podcatchers seem to download the last "media" file. Normally, this might not have been a problem as we usually just link to other web pages, but because we linked later to the SAGE Journal PDF file, that file was chosen as the one to download. (Although it still boggles my mind a bit that podcatchers couldn't be designed to download only MP3 files or others from a range of audio/video formats. I've fixed the link and podcatcher downloads are now working, but if you wound up with a PDF file instead, you'll unfortunately need to download the audio file directly from the Blue Box #56 show notes.